A boil water notice is issued by public health officials if there is concern that a disaster or other event has the potential to contaminate the water supply. 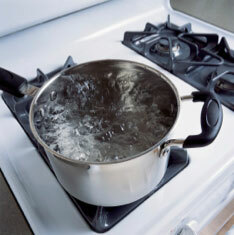 Boiling your water is an effective way to ensure that your water is safe to drink. Water should be boiled for at least three minutes (five minutes at higher altitudes) before drinking. If you have power, refrigerate any leftover water. Use boiled water for drinking, food preparation, mixing baby formula, making ice, washing food, manual utensil and equipment washing, rinsing and sanitizing, brushing teeth or any other activity.